Originally, I was trying to come up with a really whip-smart headline for this…like: “Weed Is The Gateway Drug For Gateway Point Of Sale Services,” but there was no need. 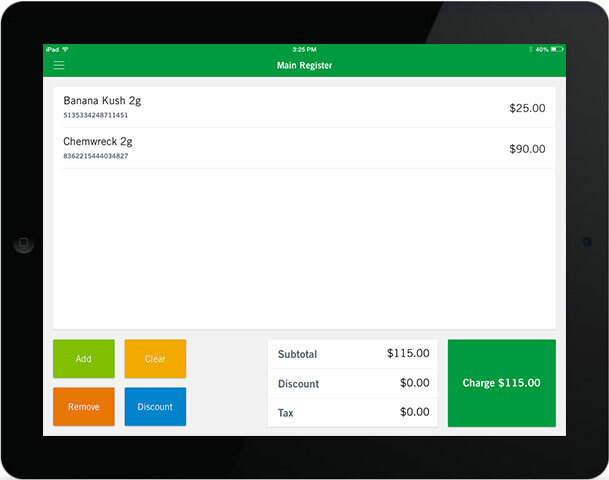 The news is simple: A super-smart group of folks that sold a company (Outright.com) to GoDaddy has launched its point of sale service specifically aimed at shops selling cannabis. They’re called Green Bits. 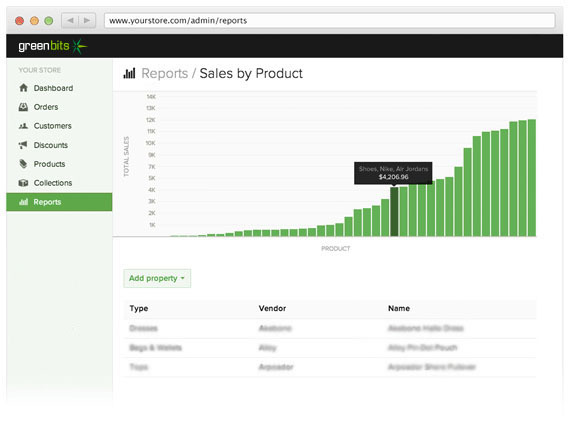 The team calls it “The easiest way to run your store” and it looks like they’re right. Sure, it tracks inventory of bud and accessories, but it keeps shops running legally by integrating with the WSLCB Traceability API. Also, the software sports inventory reconciliation just in case someone who works for you is getting high on your supply. Mobile, too, for when you’re on the run or making deliveries yourself. I spoke with the company’s co-founder and CEO Ben Curren about the company, the product and the future of the cannabis industry. TC: Can you tell us why you founded the company? BC: After selling Outright.com to GoDaddy, I decided to stop working and to play for a while. But I quickly became bored and couldn’t stop thinking about what I wanted to work on next. I spoke with Google X, and then a startup that builds small satellites. I realized that I enjoy the challenge of building businesses. So I stopped looking to join a company and decided to start one myself. I turned to my Evernote folder of startup ideas. I’ve been adding to it for years. I curated and prioritized the list of ideas by my interest level and market size. I called Trae, the best engineer at Outright, and asked if he’d be interested in investigating some business ideas with me. We ended up building drones and a smart sprinkler system before landing on a note that said, “Look at the cannabis industry.” I don’t even remember writing it, but it launched my research into an emerging market. I found a conference the following day and flew to Washington state to attend. Legalization of marijuana had passed in 2012, and the attendees were preparing for the first stores to finally open in a few months — July 2014. The two-day conference got me in direct contact with business owners jumping into the field. I was also introduced to all the regulatory compliance issues and the current solutions. I’ve built accounting, payroll, and tax solutions for small business for over 15 years and immediately knew the pain these businesses were soon to be in. BC: I went to Cal Poly and then became an Intuit Engineer working on Quickbooks. Then I started my own consulting firm, but I had trouble finding an accounting program that worked the way I wanted it to work. So I designed accounting software called Outright that was made for freelancers. Eventually I sold it to GoDaddy. I used the proceeds to launch Green Bits. In my spare time, I like to build drones and get away with my family — well, my wife makes us get away to places off the grid so I can’t work all the time. I have two co-founders — Trae Robrock and Andrew Katz, both of whom helped me build Outright. Trae, who I mentioned earlier, is our CTO. Like me, Trae loves building software for small businesses and he loves learning how to further automate their day-to-day operations. He’s what you’d call “an engineer of all things” — so you’re likely to find him building something else when not at his desk building software. Or with my cousin, who he married, and their new baby. Andrew has been designing, developing and managing web applications since he was a student at Cal Poly. At Outright, Andrew was responsible for mobile development and led the team responsible for the financial data import system and integration with third-party APIs. TC: What do you think the future of the cannabis industry is? Drug abuse will be treated as a social problem rather than criminal. Millions of people will have an opportunity to get healthy and become a contributing member of society rather than a burden on the system. States will generate tens of millions of dollars of tax revenue to put towards improving the lives of their citizens. Scientists will be able to study all the compounds of cannabis to understand its true health benefits. Some compounds like CBD have already been shown to have significant impact treating certain diseases and who know what else we’ll find. Hemp production will create more efficient and environmental building materials such as paper, clothing, fuel, and plastics. These products will be created for less money, be biodegradable, and last longer than the current options. Many multi-national businesses will be created around the recreational use of marijuana. Like the wine industry, thousands of brands, retail chains, will be established for consumers. Technology providers, like Green Bits, will exist to help these providers grow, package, distribute, and sell marijuana products efficiently to their customers. TC: What needs to change legally so that this company, and others in the space, can grow? BC: Green Bits needs the current legalization momentum to continue. The cannabis industry grew 74 percent in 2014, making it the fastest growing industry in the U.S. according to The ArcView Group. There are currently four states with legal recreational (21 and over) marijuana, and 24 with legal medical marijuana. Next year, there should be another six states, including California, with marijuana legalization on the ballot. This trend is not only domestic; worldwide, countries are legalizing or thinking of legalizing in the near future. TC: How much have you raised? BC: We haven’t raised any outside capital. I used some proceeds from the sale of Outright to start the company. Green Bits provides a valuable service that companies are willing to pay for, so cash flow is pretty good. Many of our customers opt to pay yearly. That saves them money and makes it easier for us to scale. BC: Green Bits point-of-sale currently runs over 45 percent of the recreational marijuana stores in Washington. We’re excited to announce at TechCrunch Disrupt that we now support the regulations in Colorado and Oregon. We’re the only solution that is able to completely automate compliance reporting for our customers. In 2016, we’ll add support for the additional 24 states where medical marijuana is legal, and then move to international markets. TC: Any interesting anecdotes you can share that happened during the early days of the company? Around May 2014, we had a good idea what we thought our initial product should be. We wanted to test the concept but we didn’t build the product yet. So, we searched the web for photos of an iPad based register, used Photoshop to add a rendering of our proposed software, and created a very basic website. We then created a flyer, included in the assets we provided, and mailed it to every marijuana retailer expecting to open July 2014 in Washington. Yes, snail mail not email. We were able to generate over 100 incoming calls where I was able to test various pitches and pricing models to see who would sign up. This first group of callers ended up being our beta testers and our first batch of customers. Around July 2014, we were starting to prepare to launch our first customer, 2020 Solutions in Bellingham Washington. It was crunch time and we were working like crazy to get the first version of our software together. We knew that the state regulatory system we had to integrate with wasn’t live yet so it was impossible to test or verify anything worked. So instead of automating the integration with the state system we built a way for all requests to come to us where we manually submitted them. The day the store launched there was a line two blocks down the street with CNBC filming. With all that pressure and sales the engineers were back in the office manually submitting sales to the state while building an automated solution. It took about three days to finish the integration and make the compliance completely automated. Another amusing story of this trip is that I flew up about seven days early to the store. I worked with the staff and the owners to tag all the products, enter the inventory into Green Bits, test sales. In that one week we completely changed the product design three times before launching. To be taken seriously as an industry, companies are going to need to go completely legit. That means tracking sales, filing taxes, paying full-time employees and providing benefits. That means that companies like Green Bits can slide right in and help out immediately. Plus, this business might be a little too sticky for Square or PayPal to jump into…so there’s the opportunity. As a first-mover, the team can do some serious damage by signing up shops from every state in the US that starts relaxing its current marijuana laws. And hey, maybe they can nab Snoop Dogg as an investor.